KATHMANDU, Dec 28: Nepal's trade deficit widened by 36.11 percent to Rs 569.49 billion in the first five months of the current fiscal year 2018/19 compared to same period of the last fiscal year 2017/18 as exports growth fail to catch up the rapidly surging imports bill. According to preliminary data released by the Department of Customs, the country imported Rs 607 billion worth of merchandise goods between mid-July and mid-December of FY2018/19, up by 34.25 percent in the corresponding period of last fiscal year. Nepal had imported merchandise goods worth Rs 452.15 billion in the first five months of the last fiscal year. On the other hand, total exports grew by only 11.21 percent to Rs 37.5 billion over first five months of the current fiscal year from Rs 33.72 billion in the same period last year. The share of exports in country's total trade now accounts from 5.8 percent, down from 6.9 percent in the same period last year. The share of imports to total trade, however, increased to 94.2 percent, up from 93.1 percent, according to the DoC. As usual, trade deficit with India continued to widen in the first five months of FY2018/19. 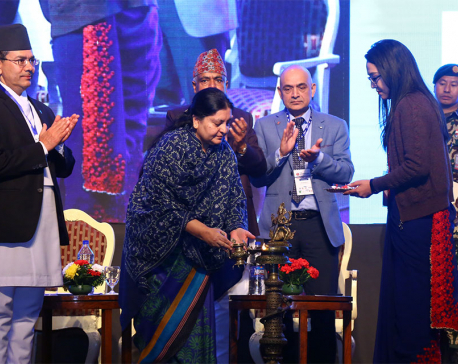 Nepal imported Rs 386.54 billion worth of merchandise goods from India during the period, while it exported goods worth Rs 21.92 billion to the southern neighbor, registering a trade deficit of Rs 364.62 billion. 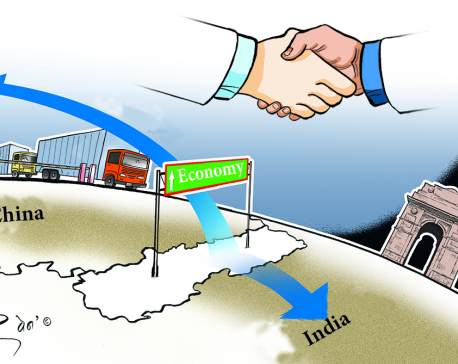 Similarly, Nepal suffered trade deficit of Rs 87.71 billion with China in the review period. China is the country's second largest trading partner. Out of 141 countries specified in the data, Nepal enjoys trade surplus with only 27 countries. Nepal enjoyed highest trade surplus of Rs 304.06 million with the United States in the first five months of the current fiscal year. 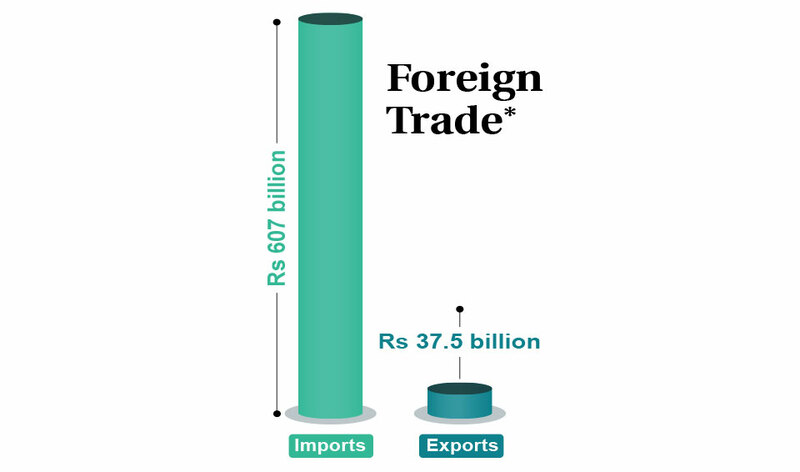 The trade surplus has been attributed to the rise in exports of carpets, bags, headgear, shawls, scarves and leather, mainly due to the tariff-free access to the US under its Nepal Trade Preference Program. Central African Republic stood second in the list of partners with whom Nepal has trade surplus. Nepal posted trade surplus of Rs 277.52 million with the African nation in the first five months of the current fiscal year. Alarmed by the rise in trade deficit, the government has been introducing some measures to discourage import of consumption goods. However, government officials say that trade deficit should not be a matter to worry about as long as imports are raw materials for industries, capital-intensive goods or equipment.